Cyber Monday is a huge shopping day. This year, sales are expected to top last year’s record $6.59 billion. Whether you sell exclusively online or have a brick-and-mortar store with a website, Cyber Monday is a great opportunity to bring in additional revenue for your business. If you don’t yet have an online store: it’s not too late. Shopify is a multichannel sales platform that makes it easy to start selling right away. With Shopify, you can build an ecommerce store quickly and sell on Amazon, eBay and through Facebook to take advantage of Cyber Monday spending. Don’t leave this revenue opportunity on the table. Get a free 14-day trial of Shopify today. Cyber Monday is the Monday after Thanksgiving where businesses offer special deals for holiday shoppers. Cyber Monday is similar to Black Friday but is typically for online deals only. Conceived in 2005 by Shop.org, the website representing the National Retail Federation, to launch an online shopping-focused day as the equivalent of “Black Friday.” Cyber Monday has quickly become one of the busiest shopping days of the year where online retailers lure shoppers by offering attractive price cuts and enticing deals. For small and independent businesses, Cyber Monday is especially important. Large retailers will be coming out with big discounts and enticing deals, but your business can compete by also having a great promotion and advertising it the right way. According to the National Retail Federation, more than four in 10 consumers say that they can’t resist making a purchase when something is on sale. Additionally, three in 10 consumers would make a full-price purchase if it’s a unique item. Cyber Monday sales continue to grow year after year as more people want to take advantage of holiday shopping deals from the comfort of their own home. Cyber Monday gives people who are traveling and visiting family for Thanksgiving weekend the ability to do their holiday shopping and get great discounts without visiting a brick-and-mortar store. Widespread support is one of the reasons why Cyber Monday sales continue to grow. A 2016 Perk report revealed that nearly six out of 10 consumers plan to shop on Cyber Monday. It outpaced even Black Friday when only five out of 10 consumers plan to shop. Whether you’re an online business or a brick-and-mortar store with a shoppable website, it’s imperative to take advantage of the shopping momentum on Cyber Monday. eCommerce giants like Amazon and Walmart might receive the most media coverage around Cyber Monday, but that does not mean they are the only retailers making sales. With a little planning, small retailers can have a profitable and competitive Cyber Monday. If you’re reading this after Cyber Monday, that’s OK. It’s never too early to start preparing for next year. Here are six simple steps to increase Cyber Monday sales. The first step in having a profitable Cyber Monday is determining what products to offer and what kind of promotion to have. 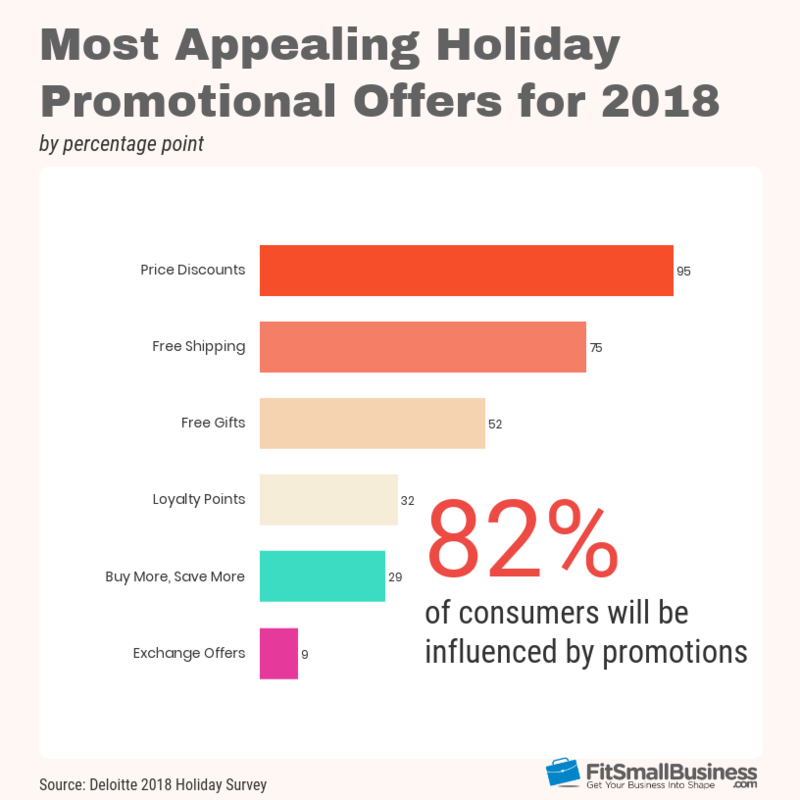 According to Deloitte’s 2018 Holiday Report, 95 percent of shoppers say that price discounts are the most appealing promotional offer, followed by free shipping and free gifts. For Cyber Monday, your best promotional strategy is offering a percentage discount or specific markdowns on particular items. 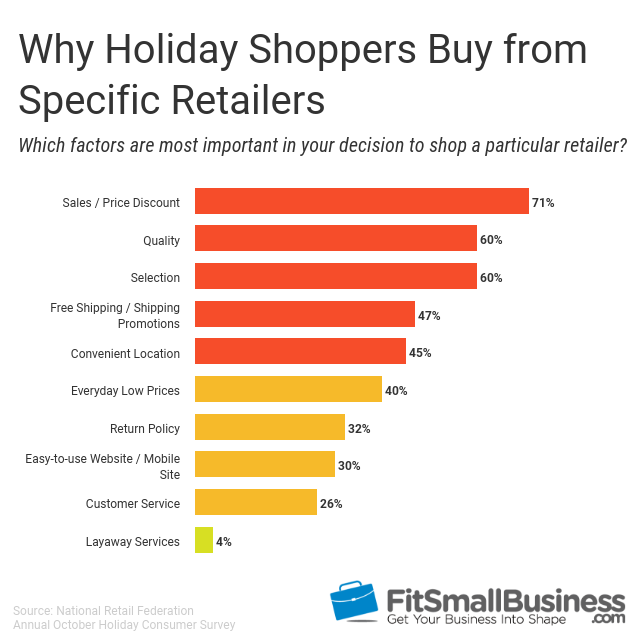 The National Retail Federation’s Annual October Holiday Consumer Survey shows that sales and price discounts are an important factor when it comes to choosing where to shop for 71 percent of consumers. Shoppers are willing to search around for the best prices, even if that means buying from a different store. In other words, small retailers can compete with larger stores by offering competitive prices. When it comes to what products to put on sale, there is no one-size-fits-all answer. Gift cards are the most popular holiday gift across the board, so it is a good idea to start with a buy-one-get-one (BOGO) gift card offer. Clothing is the second-most popular holiday gift item. On Cyber Monday, shoppers will be buying holiday gifts for friends and family, but they will also be shopping for themselves. In order to appeal to shoppers buying gifts for others and gifts for themselves, we recommend offering a percentage off deal on clothing and apparel items. If your store does not normally sell apparel, stick to BOGO gift card deals and percentage off sales on your most popular product categories. There are several different strategies for promotions and offers that any retailer can use. If you are using an ecommerce platform like Shopify, BigCommerce or WooCommerce, they will have built-in features that make it easy to offer one or more of these promotions on your site. Here are our top Cyber Monday strategies for promotions. Offering bundle deals is another great way to increase your average sale amount while also providing a good value to shoppers. Offer themed bundles with related items, which can also function as a mini gift-guide. Bundles are also a great opportunity to pair popular items with slower-moving inventory to help clear out excess and seasonal products. BOGO or half-off deals are super popular because they provide a great value for the customer, especially since we know price discounts are the most effective and popular type of sale. Like bundles, BOGO deals are also a terrific way to move dated, out of season, or dead stock. Customers will be more inclined to purchase these items when they are on sale, even if they weren’t selling at full price. This strategy is a great way to add value sacrificing your margins. Offer a free item either with a certain purchase amount — somewhere at or just above your average order — or with the purchase of a specific product. The free gift can be a mystery item, a set item or customers can choose from a few options. Of course, the gifts need to be appealing, but this is another great way to boost sales and clear out overstock or slow-selling merchandise. 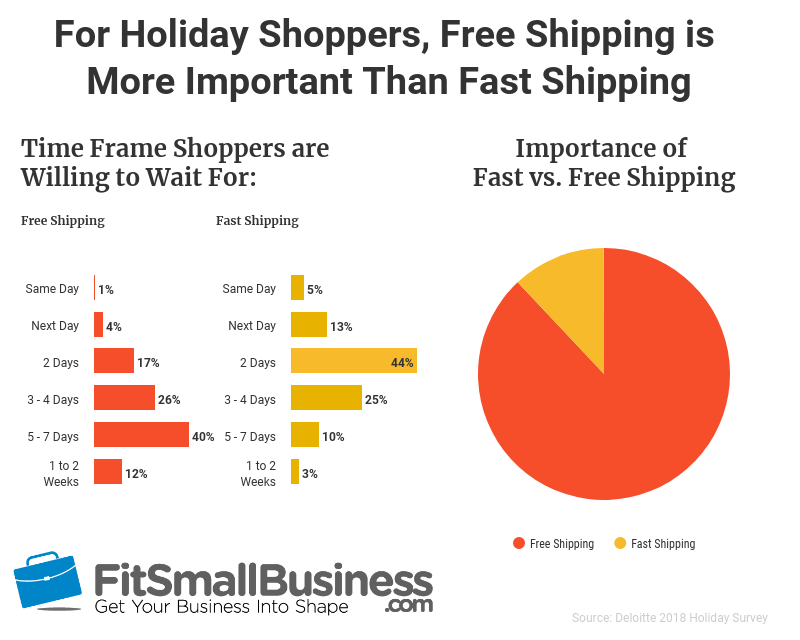 According to the 2018 Deloitte Holiday Report, 75 percent of shoppers say free shipping is one of the most attractive promotions. Offer free shipping on certain items or at a certain order price point, such as $25 or $35 orders. Make the threshold to qualify for free shipping at or just above your average sale. Offering free shipping at a certain order amount will help bump up what might otherwise be small orders, and make your customers happy. Now that you have a great deal for Cyber Monday, it’s time to develop an effective advertising strategy so that shoppers know about your store and your Cyber Monday sale. For online shopping, there are three main advertising channels we will focus on, which are Facebook, Instagram and email. Hopefully, you already have an active Facebook business page for your retail store. It takes no more than 15 minutes to set up. Once you have your Facebook business page, you can sell items directly through Facebook. This is a smart idea because it eliminates the friction of having to go to a different website for potential shoppers. For more information, visit our guide on How to Sell Products on Facebook. Before doing a paid campaign, the first step is to create regular posts to schedule throughout the week leading up to Cyber Monday. Video posts receive the most engagement on Facebook. So, feel free to make a video showcasing your products and deals. Regular image posts also perform well. You can use a free tool like Canva to create professional-looking posts. Once you have your photos and video, you can schedule the posts directly through Facebook. If you are too time-strapped to create your own social media posts, hire an affordable freelancer through Fiverr. It has professionals available for every type of project and budget. Plus, you can read reviews for each freelancer before making a decision. The best part is, no long-term contracts required. Just pay for what you need. Once your page and regular posts are set up, the final step is to advertise. Despite Facebook’s bad press this year, it is still a powerful advertising tool for small businesses because you can reach a targeted audience for a relatively small investment. There are several different ways to advertise on Facebook: by boosting a post or creating an ad campaign. We recommend creating a specific Cyber Monday ad campaign using Facebook Pixel. For a step-by-step guide on how to create a Facebook ad, visit our page on How to Optimize Facebook Ads. Instagram is a perfect match for retail and showcasing products because it is such a visual platform. Plus, like Facebook, Instagram is also shoppable. The first step is making sure you have an Instagram account set up for your business. The next step is to create posts promoting your products and deals that are shoppable. The final step is to create an advertising campaign. Since Instagram is owned by Facebook, you create Instagram ads under your Facebook Business Page. For a detailed guide, read our article on How to Advertise on Instagram. Since Cyber Monday is just around the corner and time is limited, you may also want to consider using a digital marketing agency like Hibu to get your pages and campaigns up and running in time for the holiday. It also has a number of free tools you can use to help guide your digital marketing plan. Email marketing is not a new advertising method, but it is still one of the most effective marketing tools for online businesses. According to Oberlo, 81 percent of small and medium-sized businesses (SMBs) rely on email as their primary customer acquisition channel and 80 percent for retention. In other words, email marketing will be a prime revenue driver for Cyber Monday. Many national brands send out their promotions for Cyber Monday the morning of. To avoid getting drowned out in shoppers’ inboxes, send out your promotions the night before or later in the day on Cyber Monday. Unlike Black Friday, where most people shop in the morning, on Cyber Monday people shop both before and after the workday. An effective strategy for email marketing is to promote a specific deal or product in the email. Then, have the email link to a landing page that is specific to your deal. This helps streamline purchases and make the process more straightforward for shoppers, especially on mobile. To get help setting up your landing page for Cyber Monday emails, find a freelancer on Fiverr. 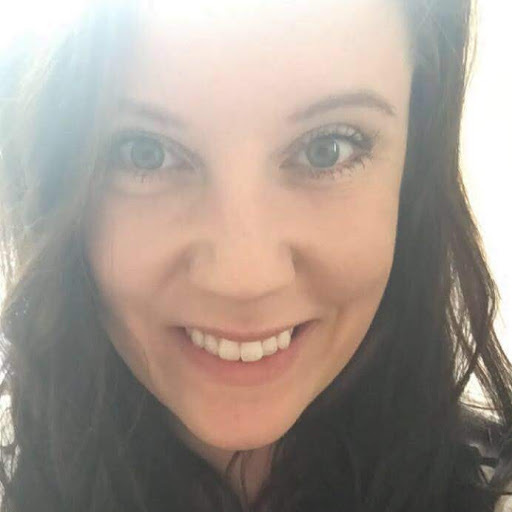 It has tons of professionals with different experience levels and price points. Now that you are bringing shoppers to your site with your great advertising campaigns and promotional offers, we need to make sure you’re providing a smooth and pleasant shopping experience. Since Cyber Monday is just a week away, you won’t be making any major structural changes to your site for the holiday. But, there are a few simple steps you can still take. 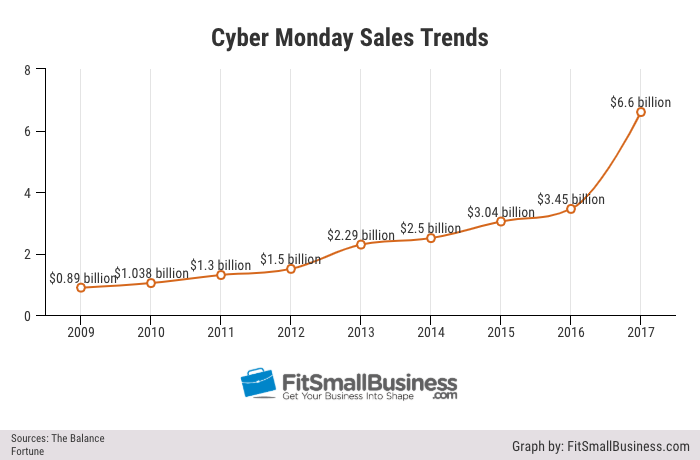 No matter how big your business is, you’ll see a spike in traffic on Cyber Monday. The last thing you want is to lose sales or have upset customers because your site crashes. Top ecommerce platforms like Shopify, BigCommerce, and WooCommerce run on systems that quickly respond and adjust to traffic demands. But, to be safe, no matter what platform you use, contact your provider and ask for flexible bandwidth so your site can handle any traffic spikes. Shoppers are clicking on your ads to visit your site to buy the specific deals you are promoting. Don’t make shoppers hunt to find your promotions once they’re on your site. Have your Cyber Monday promotions front and center on your homepage and along top and side banners throughout your site. Consumers read an average of seven reviews before trusting a business. About 84 percent of people trust online reviews as much as a personal recommendation. Shoppers will want to see reviews before making a purchase. Having them on your site reduces the chance of shoppers going elsewhere to check reviews and possibly purchasing from a competitor instead of your store. Instead of scrambling to get additional online reviews before Cyber Monday, make the most out of ones that you do have. Don’t be afraid to label a specific item as a “five-star product” if it does have five-star reviews. Put positive reviews and testimonials right in your product description for promotional items. If you have reviews on Amazon, Google, Facebook or even an active Instagram following, use a plug-in to display those comments right on your website. Getting customers on your site and clicking “Add to Cart” is only half of the battle. Last year, consumers abandoned $24 billion in online merchandise between Black Friday and Cyber Monday. On average, 75.6 percent of all online retail orders are abandoned altogether. The good news is, Cyber Monday abandonment rates are typically lower than any other day of the year, as customer’s intent to purchase is high as many shoppers assume they will not find a better deal. About 23 percent of shoppers abandon a cart if they can’t calculate the order total up front. 60 percent of shoppers abandon carts because of high or unexpected fees such as taxes or shipping. To avoid unexpected costs and totals, be super specific with your pricing language. Is the sale price reflected on the page? Will it appear once they add the item to the shopping cart? Either way, state so next to the product’s price. If you can, offer a running total that shoppers can see when they hover over the cart icon. If customers can track costs as they shop, they are less likely to be surprised at the end. 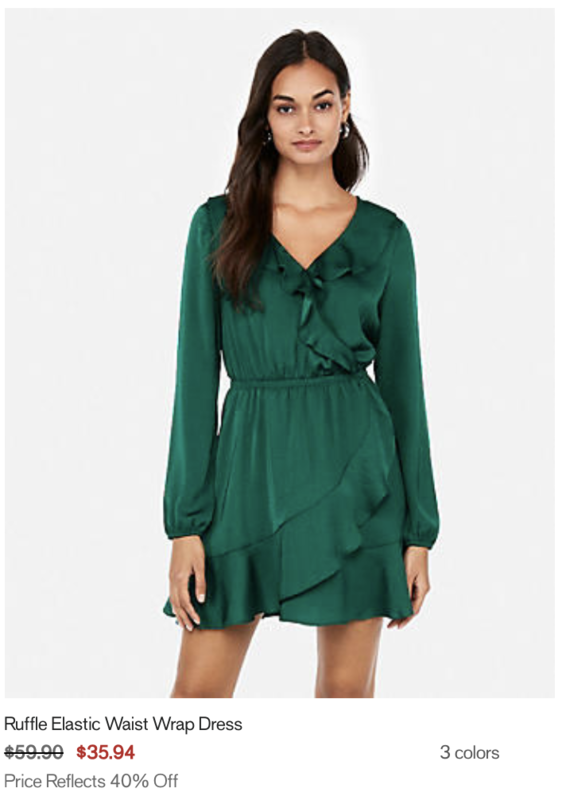 Example of a clearly labeled 40 percent off promotion from Express. Approximately 19 percent of shoppers will abandon their cart if they don’t trust the site with their credit card information. Another 8 percent will abandon if there are too few payment options. In addition to accepting all major credit cards, also accept PayPal and Apple Pay so that untrusting customers don’t have to enter their credit card information. If you sell more expensive products, Square, a free payment processing and point-of-sale (POS) system, has a feature called Square Installments, which lets customers pay over time while you still receive the full payment upfront. This is a tool that any business with a free Square account can use for items ranging from $250 to $10,000. Visit Square to sign up for a free account and start offering Installments. About 18 percent of shoppers will abandon a cart because delivery options are too slow. Be sure to offer a wide variety of shipping: ground shipping, two-day shipping, and overnight shipping with clearly labeled pricing for each. Even if the faster shipping options are more expensive, it’s better to have them as an option than to risk losing a sale. Also be sure to provide estimated arrival dates or at least timetables for when shoppers can expect their order to arrive. 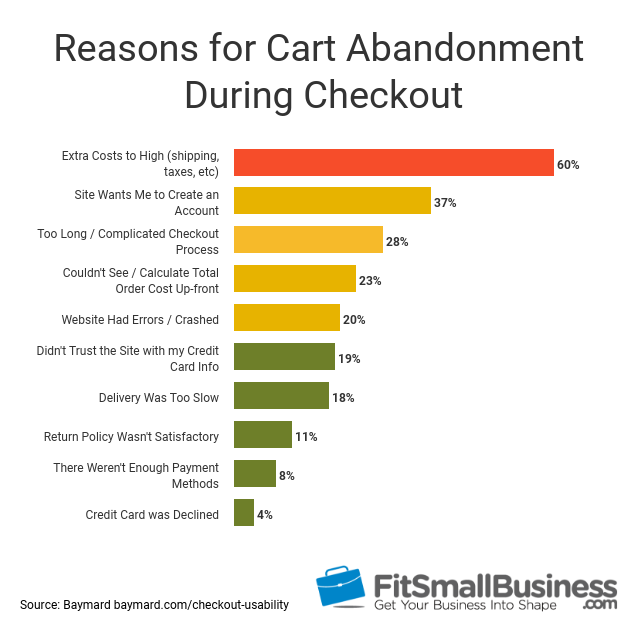 About 11 percent of shoppers abandon carts because of unsatisfactory return policy. 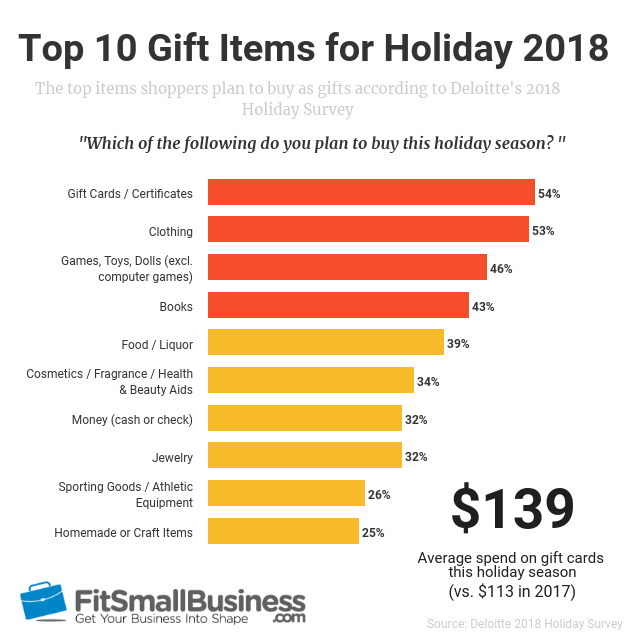 This number is likely even higher during the holiday season when items are being purchased as gifts. You definitely need to have a clearly stated return policy so that shoppers know what to expect. Include the return policy on your checkout screen and in all digital receipts. But, consider creating a more lenient policy for the holiday season. If shoppers are buying Christmas gifts on Cyber Monday, the recipient won’t even be given the gift until almost 30 days after the date of purchase. Offer at least a 60-day window to ease shoppers’ minds and minimize customer service issues. According to a Baymard Institute study, 37 percent of all shoppers will abandon a cart if they are required to make an account in order to complete the purchase. We all want to collect customer data and contact info, but not at the expense of sales. Give shoppers the option to create an account or checkout as a guest. Every screen a shopper has to click through or a data field they need to enter is an additional opportunity for you to drop the sale, especially if the customer is shopping on mobile. Having one-click payments options like PayPal and Apple Pay will help streamline this process. For customers who do enter their credit card information, have the option to save their info for future payments to make it easy to repurchase. If all else fails, try to win back lost customers with email marketing. Many major ecommerce platforms like Shopify have features that automatically send out emails to lost customers with links back to their abandoned cart. Top reasons for ecommerce shopping card abandonment according to Baymard. Cyber Monday is a great opportunity to make new sales and earn new customers. 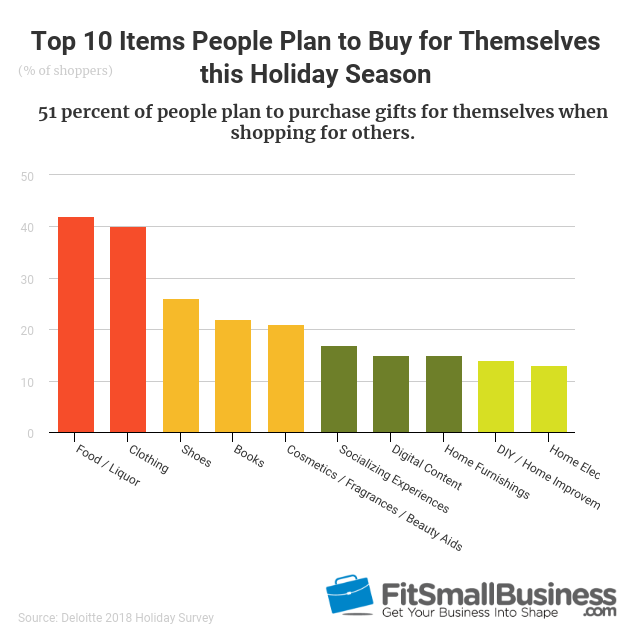 Ideally, these customers will continue to buy from you long after the holidays are over. According to Small Business Trends, repeat customers spend 33 percent more than existing ones. Even if you manage to just hang on to a few of your Cyber Monday customers, the results in time will be well worth the effort. Here are a few Cyber Monday Strategies to increase customer retention. Approximately 82 percent of customers say they have stopped patronizing a business due to poor customer service. Having top notch customer service is super important, especially for small online businesses where customers aren’t seeing you in person, and you don’t have the credibility of a large brand to stand behind. 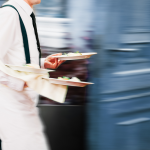 Providing great service will help humanize your business and make it more trustworthy. Above all else, just be open, honest and responsive to customers. According to the same study, 60 to 70 percent of shoppers will do business with a company again if it deals with a customer service issue fairly, even if it does not resolve in the customer’s favor. 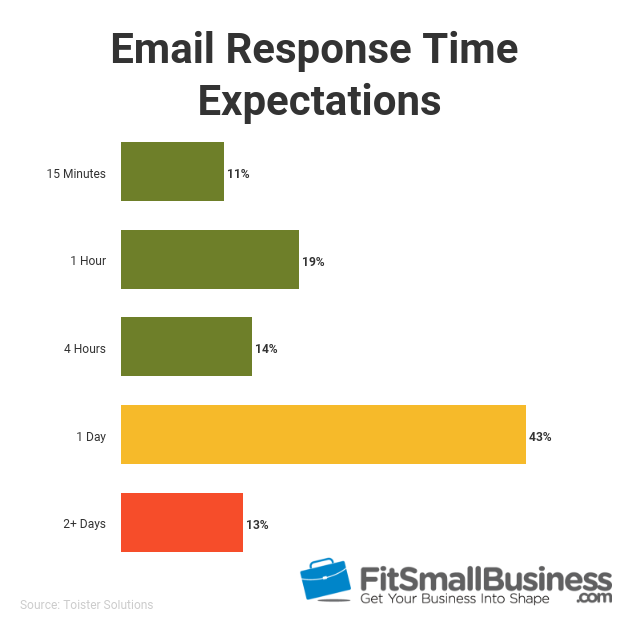 87 percent of shoppers expect businesses to respond to their emails in one day or less. Most online stores have some type of box or form for customers to sign up for a newsletter. Change up your email sign-up verbiage so that it’s more exciting than “Sign Up to Receive Emails.” Try something like “Like What You See? Get More Great Deals Year-round.” Then, of course, follow through with your promise of great deals by sending out emails with additional holiday sales and new year promotions. Hopefully, by following all of these tips, you had killer Cyber Monday sales. Believe it or not, once the holiday season is over, it’s already time to start planning for next year. There are several strategies that will really take your sales to the next level, but require more extended planning. 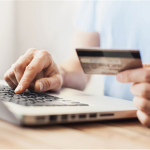 Here are some strategies to prepare for Cyber Monday 2019. Search engine optimization (SEO) helps your website appear higher on Google search results so that potential customers are more likely to find your business. First, you need to find out what consumers are looking for. Keyword research enables you to see how people are searching for products on Google. For example, are more people searching for “virtual reality headset” or “VR headset”? ), so you can optimize your website and ecommerce inventory for those keywords. Visit Google AdWords, and use the Keyword Planning tool to search for keywords. Input your product or service and then click on “Get ideas.” Then, click on the keyword ideas tab to see average monthly searches for your product or service. AdWords also provides keywords by relevance, so you want to choose the ones that post higher searches. SEO is not something that can be tackled overnight: increasing your search result rankings takes a long-term strategy and dedication. To get a better understanding, read our SEO tips from the pros. Take the same concepts we used to create our Cyber Monday sales posts and use them to showcase your products year-round. By scheduling your social media posts ahead of time, you can keep an active page by just investing a few hours a week. Most followers on social media equal more eyeballs for your Cyber Monday promotions. So, work on building followers throughout the year so that next year’s promotions have an even greater impact. 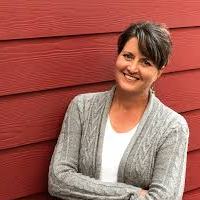 If you don’t have a few hours a week to dedicate to your business’ social media presence, if it is something that you don’t want to handle yourself or even if you just need a little help getting started, consider using a digital marketing agency dedicated to working with small businesses like Hibu. It has a variety of tools and specialists to get you up and running in no time. Brick-and-mortar stores have the advantage of letting customers feel and test products in person before making a purchase. For online sellers, your product page and photos are all you have to work with. Give shoppers a clear idea of your products and ease any concerns by having high-quality photos that highlight products individually and lifestyle shots that show your products in action. Online reviews help build trust among consumers. In addition, they help shoppers understand what makes your product or service stand out from the competition. A BrightLocal study reveals that nine out of 10 customers read product reviews before making a buying decision. You need genuine reviews to help convince your customers that what you’re selling is worth their money, whether they are buying something for themselves or a gift for someone else. Overall, online sales and specifically mobile sales are becoming an increasingly large part of overall holiday sales. This year, 55 percent of shoppers plan to shop online this holiday season. Cyber Monday is the busiest online shopping day of the year in the United States but having an online and mobile strategy is important for keeping your sales strong throughout the holiday season and the year ahead.